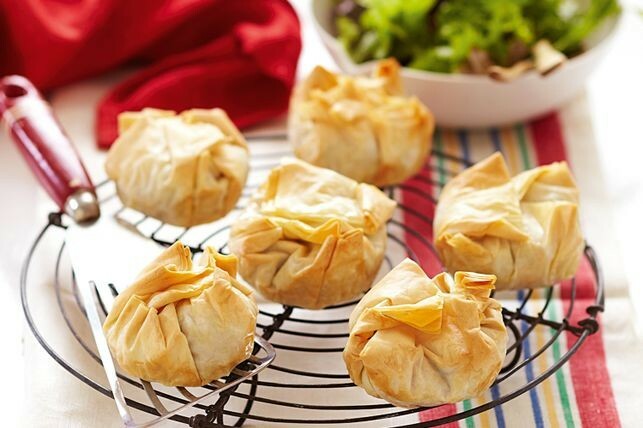 Delicious beef and vegetable pies that are super easy to make, quick and healthy. Great as a snack and in a fun shape to share at parties or simply amongst the family. Step 1 – Preheat oven to 180°C/160°C fan-forced. Grease a 12-hole muffin pan. Step 2 – Heat oil in a frying pan over mediumhigh heat. Add onion and garlic. Cook, stirring for 3 minutes or until softened. Add mince. Cook, breaking up mince with a wooden spoon, for 8 minutes or until browned and cooked through. Add vegetables, barbecue sauce and tomato paste. Cook, stirring, for 5 minutes or until vegetables are just tender. Remove from heat. Set aside for 10 minutes. Step 3 – Place 1 sheet filo on a flat surface. Spray with oil. Top with 1 sheet filo. Repeat layering with 3 sheets filo. Cut filo stack in half lengthways. Cut each piece into thirds. Press each piece into 6 holes of prepared pan, allowing overhang. Repeat with remaining filo. Step 4 – Divide mince mixture between pastry cases. Fold edges over filling to enclose. Spray with oil. Bake for 20 minutes or until golden and heated through. Stand for 2 minutes. Serve and enjoy! Note : We used a carrot, pea, capsicum, onion and corn frozen vegetable mix. Tip: Filo pastry dries out quickly on contact with air. Cover with a damp tea towel to prevent it drying and cracking.